Vadodara, April 16: After Maneka Gandhi, another Bharatiya Janata Party (BJP) leader threatened voters if they don't vote for the party. 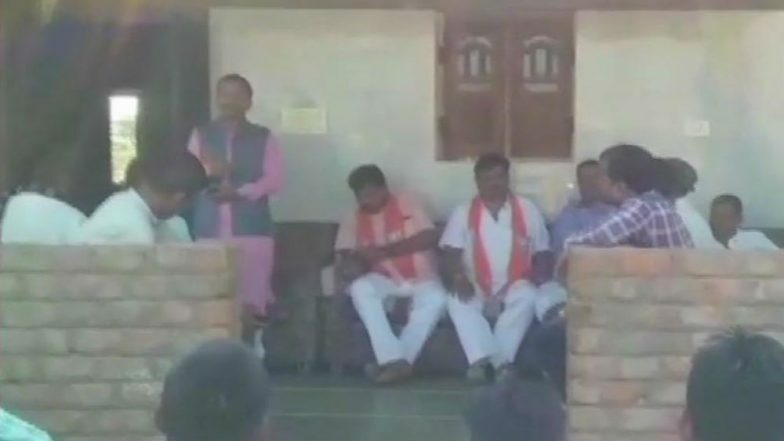 Addressing a gathering in Dahod Lok Sabha constituency, Ramesh Katara, an MLA from Gujarat's Fatehpura, told people that Prime Minister Narendra Modi has installed cameras in polling booths and he would know who votes for the BJP and who votes for the Congress. "This time, Prime Minister Narendra Modi has fitted CCTV cameras in every polling booth to watch who votes for BJP and who votes for Congress. He would watch sitting in Delhi and if BJP gets fewer votes from a particular booth, the area will get less government grants," Katara said. The BJP legislator was campaigning for BJP’s Jashwantsinh Bhabhor who is contesting the Dahod Lok Sabha seat. ECI Ban on Yogi Adityanath, Mayawati: Supreme Court Satisfied With Election Commission's Action. Katara also threatened people that no work would be done in a particular area if people from there don't vote for the BJP. "Aadhaar Card and all cards have your photo now. If there are less votes from your booth, then he (PM Narendra Modi) will come to know who did not cast vote and then you will not get work," the BJP MLA was quoted as saying. A video of his claims is also going viral on social media. Reacting to Katara's statement, Congress said it will approach the Election Commission of India (ECI) seeking action against him. "We wish that EC will take impartial action against the BJP MLA and ensure free and fair election is held in Gujarat," Congress spokesperson Manish Doshi said. On April 6, BJP legislator Madhu Srivastava had threatened people with "dire consequences" if they did not vote for the BJP. Recently, Union Minister Maneka Gandhi asked Muslims in Pilibhit Lok Sabha seat, her constituency, to vote for her if they wanted jobs. The ECI on Monday barred Gandhi from election campaigning for 48 hours.